Neighborhood: Deer Run Village $515,000. 3 Bedrooms | 3.5 Baths | 2,869 Sq Ft NESTLED ALONG THE 3RD GOLF FAIRWAY! This home has cozy cottage charm in front. In back, you’ll be amazed—this home is the center home of the three pictured in the aerial golf view below. What a view! OV E R L O O K I N G T H E 3 R D G O L F FA I RWAY, this Craftsman-style Deer Run home, by Oakbrook Builders is located on a private Cul-de-sac in Deer Run Village. A lovely master suite is on the main level. Open kitchen, stone fireplace in Great room has a spacious open floorplan with excellent views of the #3 fairway. 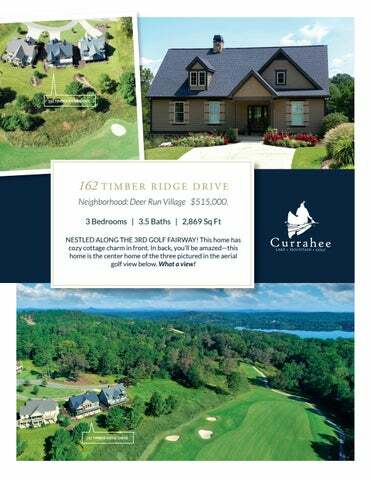 Neighborhood: Deer Run Village $515,000.